During the eighteenth century about the time of the American Revolution, both French- and Irish-Catholics immigrated to America's predominantly English-Protestant colonies. After the war's end and while the several states were developing their own constitutions, Connecticut included a clause in its 1818 document acknowledging the various religious preferences of the people who settled in the state. 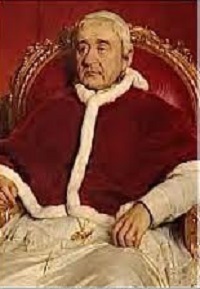 Although Catholics received legal equality in the expression of their faith, no Catholic church had yet been built. Hartford became soon the nexus of the Catholic faith in Connecticut. By 1835, 700 Catholics and three priests lived and practiced their faith in Connecticut. 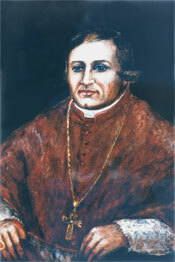 On November 28, 1843, Pope Gregory XVI issued a Papal Bull establishing the See of Hartford with Reverend William Tyler, Vicar General of Boston and a convert to Catholicism, as its founding bishop — for more information on the history of the Archdiocese of Hartford, refer to the archdiocesan web-site http://www.archdioceseofhartford.org/archdiocesehistory.htm. In 1841, Father John Brady of Hartford, one of the first three original priests, found himself snowbound in the distant village of Collinsville. In 1849, there were but nine priests to administer to the wants of the Catholics throughout the State of Connecticut! . . . .
One of those men was the Rev. Luke Daly, then pastor os St. Mary's Church, New Britain. His spiritual charge comprised New Britain, Farmington, Berlin, Bristol, Forestville, Collinsville, New Hartford, Simsbury, Tariffville and Rainbow. Father Daly's vision was that of a Collinsville parish; with the help of nine Irish-Catholic settlers he realized that vision — the names of those settlers appear in the sidebar. For the new church, Mr. Peter Myers gifted land that he had purchased from the Collins Company for $150 — roughly $4,200 in 2013 dollars. He, also, helped transport the lumber and stone for the building's construction at no charge to the church. Mr. Michael Sinott donated $200 — roughly $5,500 in 2013 dollars — to the cause. 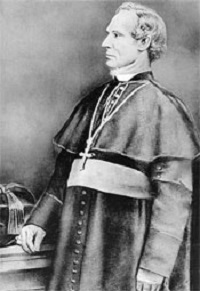 On August 22, 1852, Hartford's second bishop, the Right Reverend Bernard O'Reilly dedicated the church. Upon St. Patrick's elevation to an official parish in December, 1856, Father Patrick O'Dwyer was its first appointed resident pastor. St. Patrick Church in Collinsville served all of the surrounding area including New Hartford and Tariffvile and became the center of worship for all Catholics in the area. By 1898, the parish membership was 1,100 — 500 Irish, 400 French, 100 German, and 100 Polish — which represented a 120% increase from its original population. Today, the parish serves primarily the communities of Canton, Avon, Burlington, New Hartford — six ZIP codes in all — and our sister parish of Ste. Thérèse de L'Enfant Jesus in Lilavois, Haiti. During the largest immigration period in America's history, 1890 – 1910, large numbers of Italian and Polish immigrants joined the existing population of Irish Catholics in Avon which resulted in Avon's becoming a mission of St. Patrick Church in Collinsville during the first decade of the twentieth century. Then pastor Father William P. Kennedy made arrangements to have masses celebrated in Schoolhouse Number 5 — later called Towpath School. Father Kennedy, soon thereafter, started raising money to acquire land to build a chapel. In 1919, a 150-person chapel was dedicated and, in 1922, the mission transferred to the separate parish of St. Patrick's Church in Farmington (source: www.stannavon.com). On January 30, 1912, the mansion owned by Sam Collins, founder of the Collins Company, was razed by fire. The grounds overlooking the Farmington river from their Collins Road location, became the home of the parish-operated Calvary Cemetery. One of three cemeteries operated by the parish corporation. On March 21, 1925, a fire did severe damage to the church and destroyed most of the parish records. Afterwards, the storage of records was at St. Mary's of New Britain as it had been up until 1861. No one ever learned the cause of the fire. While planning occurred for a new church, parishioners celebrated baptisms, funerals, and masses at the Collinsville Town Hall. Then, in 1933, the decision to build a new gothic style stone church resulted in the removal of the rectory to its current site at the corner of Burlington Avenue and Church Street which is where the old church stood before the fire. The newly vacant lot provided more space to build a new church. The picture on the right shows the original church on the site of today's rectory which is visible in the background when it stood on its original site. As a matter of interest, St. Patrick Church straddles the Burlington-Canton border with today's church on the Burlington side and the rectory on the Canton side in the Collinsville section of town. 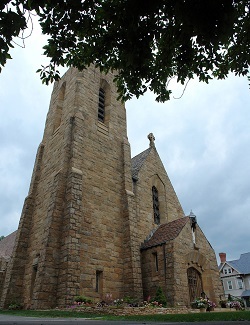 The exterior of the church consists of stone quarried in Glastonbury, Connecticut, and features a slate roof, belfry, and large oaken doors. Each door handle is forged in the shape of a serpent. The architect desired durability, so he specified stone floors, massive oaken rails, and solid buttresses. The focal point of the church is its reredos made in Germany of white oak. A bas relief carved to depict the crucifixion of our Lord. With the cornerstone being laid in 1933 — see picture at right — the installation of the reredos occurred two years later following the completion of the church interior. On November 22, 1936, the Most Reverend Maurice F. McAuliffe, D.D., the Eighth Bishop of Hartford, dedicated the new church. As of 2017, St. Patrick Church has a membership of approximately 700 families who participate in the Eucharist, volunteer their time to various councils and ministries, and make generous financial contributions. If you have any history about St. Patrick Church and Parish that you wish to share, then, please, drop us a note by clicking here. The Right Reverend William Tyler, D.D. The Right Reverend Bernard O'Reilly, D.D. 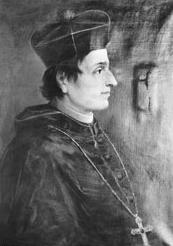 The Most Reverend Francis P. McFarland, D.D. 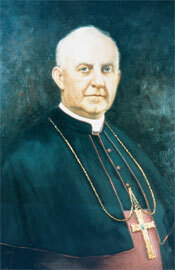 The Most Reverend Maurice F. McAuliffe, D.D.